The Only U.S. State With Commercial Coffee Bean Production Is? The Oldest Known Trees Are All Members Of What Species? Although we grow vast amounts of coffee to feed humanity’s practically bottomless desire, the locations where one can grow good coffee beans is much smaller in range than the distribution of people who love the end product. Arabica beans can be grown in two ideal climates: subtropical regions at an elevation of between 1,800 and 3,600 feet that have very well defined rainy and dry seasons (like parts of Mexico, Brazil, and Zimbabwe), or at equatorial regions with an elevation between 3,600 and 6,300 feet where frequent rainfall (like parts of Kenya, Colombia, and Ethiopia) keep the crop almost continuously flowering. 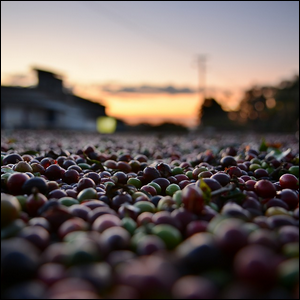 Robusta coffee is grown between sea level and 3000 feet and is more tolerant of variations in farming conditions than Arabica. While Americans consume huge amounts of coffee, the vast majority of it, thanks to a lack of suitable coffee cropland, is grown outside the U.S. in places like Mexico, Ethiopia, and Brazil. The only U.S. state with commercially viable coffee cropland is the state of Hawaii, which thanks to a very “steady” tropical climate with adequate rainfall and both sea level and high elevation areas, can grow both Arabica and Robusto beans—though the most famous Hawaiian coffee, from the Kona region, is almost exclusively Arabica.